When you are savoring something sweet, but you don’t want to break with your good habits, this might just be the perfect solution for you: a sweet, but yet wholesome black rice pudding. Soak the black rice and white rice separately for 1 hour. Boil the black rice until medium soft. Add white rice to the black rice, and bring to a boil until medium soft. You may want to add a little more water if too thick. Put in the palm sugar and salt. Stir well. Cover and simmer on low heat until well cooked and soft. Serve in small bowl and pour in the coconut milk on top. Feel free to add any toppings of your choice, such as nuts or fruits. Enjoy! 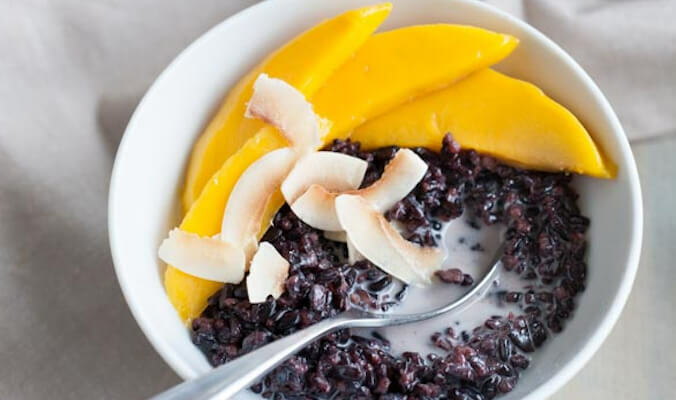 This recipe for a yummy black rice pudding was originally published on www.sukhavatibali.com, a healing hotel by Healing Hotels of the World.